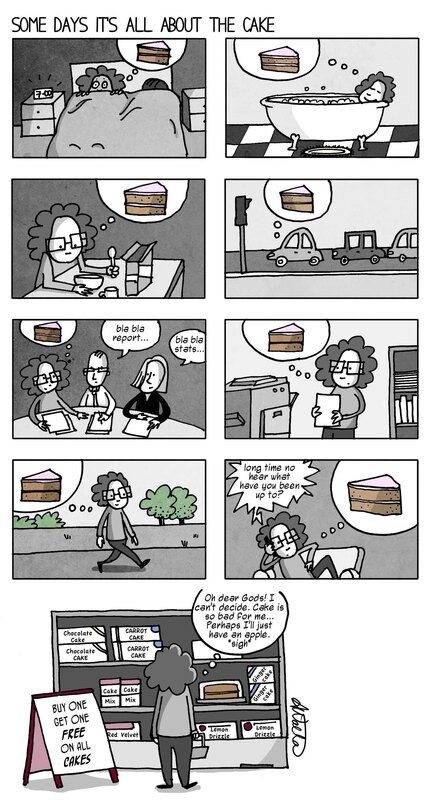 This entry was posted in Diets, Life and tagged cake, cartoon, comic, food, funny, humor by bighair63. Bookmark the permalink. Thanks for the go-ahead. I hope you love it! …oh man, I can empathise…the voice in my head screams “PIES & CAKE”…..speaking of which …it must be time for a snack…. …bacon, bacon, bacon….dare we go on?…. You have that voice too? I’m pretty sure I could tolerate invasive open-heart surgery without anaesthetic if they just brought me a big pile of chocolate I could tuck on throughout. The only way to get it out of your system is to eat lots and lots of cake! At least that is what the bakeries would say.